Home » News » Blog » Why is good ventilation important in the stadium environment? If you live in a city or a major town, the air you breathe is probably polluted. Air pollution is now a major contributor to ill health in the UK. Although dirty air isn’t directly responsible for fatalities, it is thought to be responsible for 40,000 early deaths annually. As a leading installer of HVAC systems, we regularly communicate the impact poor air quality can have within homes and workplaces. Whilst there are few ways you can limit exposure outside your home and business premises, buildings that are used by the public can be made to do more to safeguard the individuals within from the damaging effects of poor air quality. We have helped clients across the South East to overcome a variety of heating and air conditioning challenges to ensure their stadia and sporting venues are healthy and comfortable places to spend time for both players and spectators. In addition to providing stadia HVAC maintenance and repair, we design and install systems to guarantee high air quality. Ensuring good ventilation is a vital part of the wider HVAC puzzle. Players and spectators both demand a comfortable experience. Without the right ventilation techniques and technology in place, stadia can be stuffy and even unpleasant. We’ve touched on the long term impact of poor ventilation, even in open air environments, and short-term effects can be felt by those using your stadium. Poor ventilation has been linked to several health issues, including headaches, allergies, rashes and asthma. The increased presence of impurities, such as pollutants and bacteria, also make those exposed to poor air quality more susceptible to illness. Using both natural and mechanical ventilation, you can keep individuals as cool as possible. The challenges faced by those looking to cool a lot of people in a confined space are evident. With the right cooling and ventilation mix you can make your stadium instantly more comfortable and reduce temperatures all round. It will no doubt cost you more to heat and cool your stadium than the average residential or commercial premises, but that doesn’t mean accepting sky high energy bills. With the right level of natural ventilation, you can let your stadium do the hard work for you, lowering associated energy costs in the process. 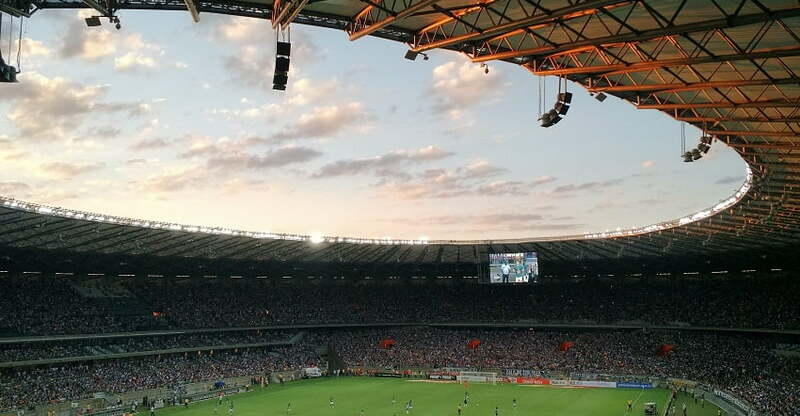 To find out more about the World Cup inspiring AC technology we provide, please contact our stadia specialists today.